This is a very small serve of pasta with seafood, but we all had seconds. In Italy less seafood would be used – it is pasta with a condiment (seafood sauce) and not seafood with pasta. The packet of dry pasta was bought in Amalfi where my friends were holidaying recently. The packet was packed in a suitcase and arrived in Broadbeach on the Gold Coast in Queensland where they live. Last week I visited these two friends who had purchased the pasta for me and were waiting for my comingl to cook it. All four of us who were eating the pasta love seafood and this is what we did. Fresh prawns and squid are prolific on the Gold Coast and the idea of using the broth left over from steaming some mussels open appealed to us. Also there was plenty of basil and fresh thyme in the fridge, left over from the meal of the night before. White wine is always on hand as are garlic and onions. The colours for the pasta are all derived from vegetables and spices: spinach is used for the green, beetroot is used for the magenta, sepia (ink from ink fish or squid) for the brown, paprika for orange and the yellow is derived from turmeric. The makers call it Pasta Fantasia Multicolore – it is easy to guess what these words mean and the mixture of shapes and colours and stripes are truly very appealing visually. Unfortunately the flavours of the vegetables and spices were not at all evident and if they had been, the pasta would have been truly fantastic (in the true sense of the word). We cooked the pasta at the same time as we cooked the seafood. Clean the mussels and place them into a pan with a little water. Cook for 5 minutes or longer, making sure all the shells have opened. If some don’t, cook the unopened ones for longer and they will open. Remove mussels from their shells, but save a few for decoration and save the broth. The broth will be quite salty because the mussels would have released their juices and sea water. Filter it before using in case there is grit. Some of the broth will be used to flavour the seafood part of the cooking and the rest can be used with the boiling water to cook the pasta. we ended up with about 1 and 1/2 cups of broth. In a large, heavy based pan heat the olive oil over medium heat. Add the onion, garlic, red pepper flakes and sauté for 3-5 minutes until golden. Add the squid and cook for 3- 5 minutes, then add the prawns, a pinch of salt and pepper and stir them around in the heat until they colour. Add the wine and about 1/3 cup of the mussel broth and the herbs. Evaporate some of the wine. 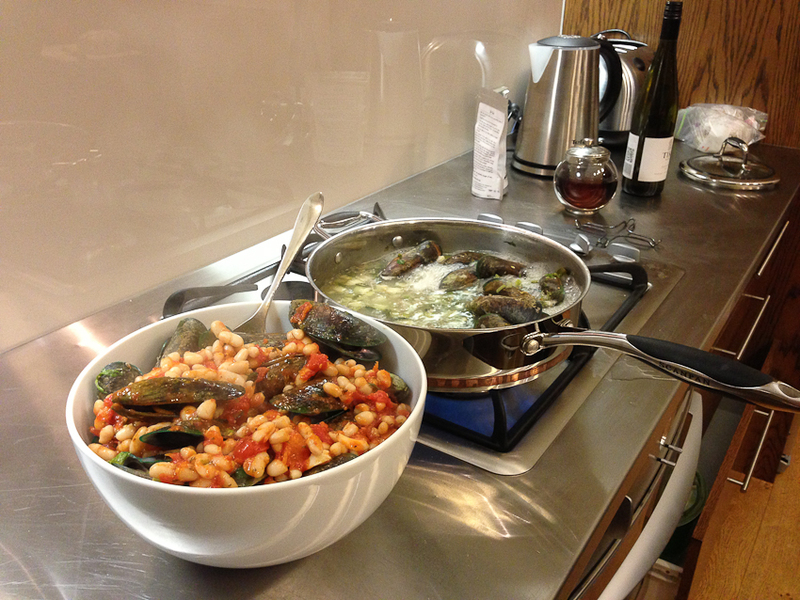 Add the mussels and cover contents with a lid – cook for 3-4 minutes. Bring a large pot of water mixed with the left over mussel broth to the boil over high heat. Adjust by adding salt if it needs it. Add the pasta and cook it till al-dente and stirring occasionally. The packet states cooking time is about 9-11 minutes. Drain pasta and add the seafood mixture. Toss to combine. Add more basil if you wish and either transfer it to a a serving platter or serve it from the pan. We are very good friends and we served it from the pan. I love mussels: they are just so quick to cook, sustainable, economical and so flavourful. By using different herbs and adding a variety of ingredients you can vary the looks and taste of mussels and have a new dish every time. Mussels are called cozze in Italian. Mussels or vongole (pipis or cockles) cooked with pulses (usually chickpeas or cannellini or lima beans) feature in many cuisines – Italian, Moroccan, French, Spanish and Greek and there are likely to be more examples. Each cuisine may have a few variations: as an Italian I use parsley, the French recipes may suggest using thyme, Moroccans may add harissa and the Spaniards may add chorizo. Fennel is in season and its aniseed, liquorice -like flavour compliments the taste of any seafood. I also like to accentuate the taste of the fennel by adding 1 teaspoon of fennel seeds or instead of the wine, using one of the anise flavoured alcoholic drinks, like Ricard, Pastis or Pernod (French) or Raki (Turkey). Ouzo (Greek) and Sambuca (Italian) are sweeter in taste (contain sugar) so unless you particularly like sweetness do not use too much. I have mentioned the most popular of the alcoholic beverages, but there are more in other countries. I use a lot of wine or alcohol in my cooking but this is not compulsory. I do not use salt when I cook mussels as they release their own liquid and this is usually sufficiently salty. Prepare the fennel: remove the tough outer leaves, slice the fennel and chop finely any of the fronds. Because I prefer to have some crunch in the fennel I slice it into medium -thin slices, but if you prefer it to be soft, slice it very thinly. Substitute the fennel with celery if you prefer. Use a heavy bottomed large saucepan with a tight fitting lid, heat 2 tablespoons of the oil and sauté the garlic, sliced fennel and fennel fronds. Add chickpeas, parsley, pepper or chilli flakes to taste and 1 cup of liquid – either wine or anise flavoured alcohol and water – and bring to the boil. Add mussels, cover and cook until they open. Serve with the broth. Drizzle some extra virgin olive oil on top. Use bread to mop up the juices. A must when in New Zealand is to eat the green-lipped mussels. They are so much larger and meatier than the varieties of black mussels common in Australia and Europe. I stayed with friends on Waiheke Island located in the Hauraki Gulf. It is about 17.7 km from Auckland in the North Island of New Zealand. I bought the mussels from the local fish shop and cooked them with extra virgin olive oil, white wine, parsley and quite a bit of garlic (Cozze in Brodetto). 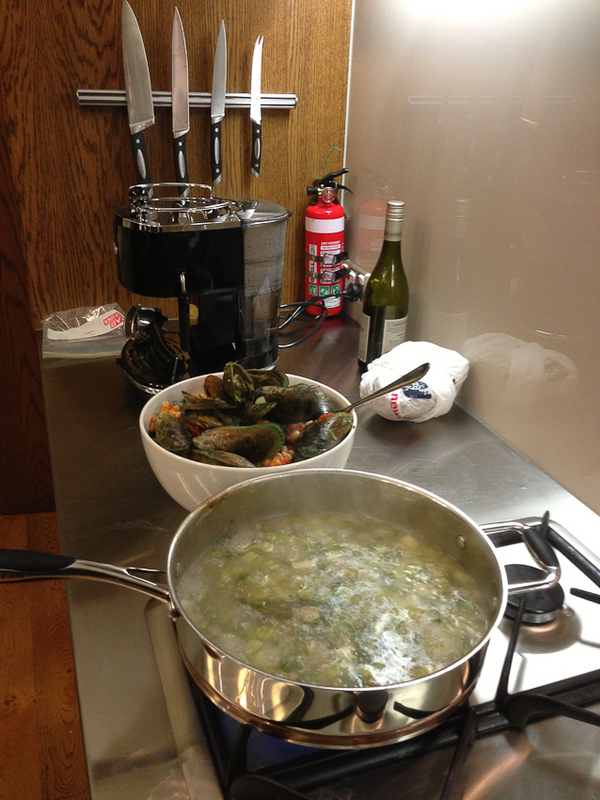 The next time I cooked green lipped mussels was a few days later when I visited other friends in Queenstown in the South Island. I bought the mussels in another great fish shop in Dunedin and both towns are in the South Island of New Zealand. I cooked these with tomatoes and cannellini beans and these are the photos and the recipe. On this occasion I used tinned beans. Black mussels can also be used in this recipe. Place the tomato, basil or oregano, extra virgin olive oil and liquid from the mussels in a saucepan and cook uncovered for 10-15 minutes until reduced to about 2 cups. Place mussels in a large, wide saucepan, add wine and parsley, cover and place over high heat to steam open. 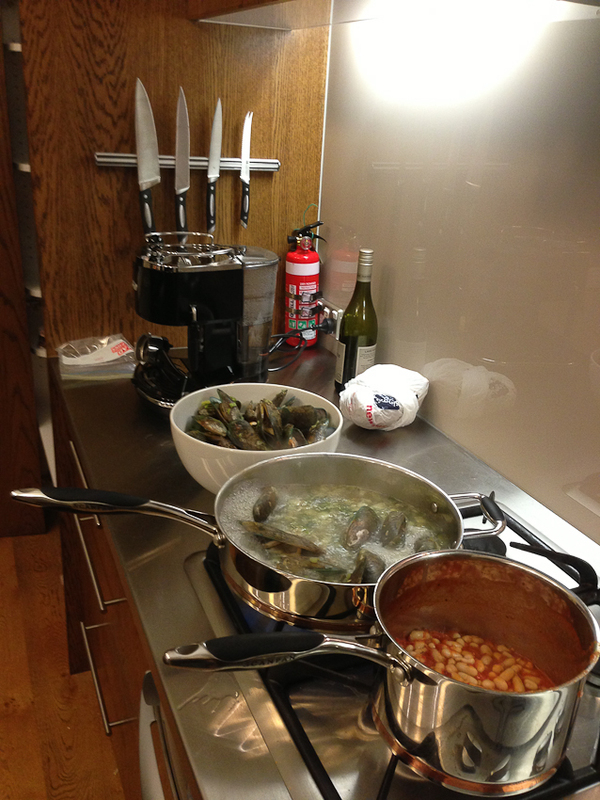 Remove the open mussels from the cooking liquid as you go (I placed mine in a large serving bowl). Leave the unopened ones in the liquid until they all open. Evaporate the cooking liquid until you only have about 1 cup of concentrated liquid. This will be salty and this is why no salt has been used elsewhere. Add the cannellini to the salsa and heat. Combine all of the ingredients together and serve. There are many Italian recipes cooked alla pizzaiola and If you cook something “alla pizzaiola’ it will have tomatoes, garlic, and parsley; in this case there are also anchovies and chillies. This mixed fish braise is very easy to cook and although the recipe may appear to have too much garlic and chillies, the flavours meld into a mild, sweet flavoured sauce with subtle tastes. Serve the dish with bread to mop up the flavourful liquid. The anchovies add another layer of taste and do not overwhelm the flavours of this dish; if you do not like them, leave them out or, for a milder taste, use white anchovies (called boquerones, from Spain). Vary the amounts of shellfish and fish to suit your tastes, for example the last time I made this dish I used only fish fillets and it was great. Cut fish fillets into serving size pieces. Pat the fish dry, rub with a little salt and pan-fry them in a in a large frying pan with a little of the oil. Remove them and set aside. Pan fry the squid rings in the same pan and set aside. Heat the rest of the oil and over medium heat sauté the garlic and chilli until the garlic begins to soften – with cooking, these ingredients will disappear in the sauce. Leave some of the seeds in the chillies if you like hot food. Add the tomatoes, parsley, a little salt and cook the sauce until it is reduced. (Remember that the anchovies will be salty and that the mussels and cockles will also release their salty liquid). Place the mussels, cockles and prawns into the sauce, cover and cook until the mussels and cockles have opened. The prawns will cook at the same time as the mussels. Add the fish and squid to the pan and gently press them into the sauce ensuring that the sauce covers them and heat through. I usually cook mussels in white wine with herbs, garlic and orange peel, but it is so easy to achieve a totally different taste by using different herbs and adding a few different vegetables. These mussels that were cooked for me by my friend who lives in Queensland. She added a leek, a fennel bulb and julienne zucchini; the result is a thick soup and we ate it with crusty bread. She used oregano as the herb but thyme or tarragon would also work –these are the herbs of Provence. Because fennel was used in her recipe I have suggested using Pernod or Ricard (anise-flavoured alcohol) rather than wine or adding some crushed fennel seeds to enhance the anise taste. This is optional. On the day that we cooked the mussels we had gone to a market and we had purchased some very good red carrots and small Brussels sprouts. Although I would not usually accompany a soup with side dishes of cooked vegetables, on this occasion we did – we wanted to eat them while they were so fresh. 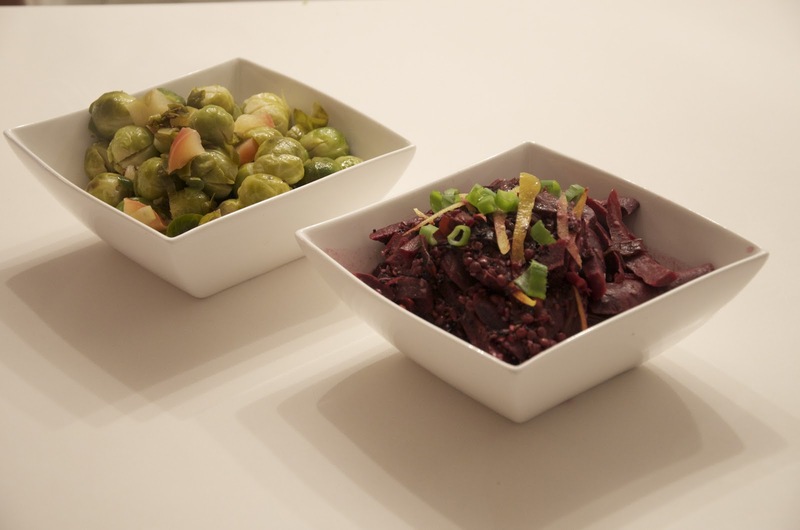 I do not just cook Sicilian, and on this occasion I cooked the Brussels sprouts with garlic and apple and the red carrots with spring onions, caraway seeds, orange peel, some Puy lentils (left over from the night before) and some pomegranate molasses. We ended up eating these as a starter. 1 tablespoon of chopped parsley to decorate. Sauté garlic, leek, fennel and spring onions over low heat until the vegetables have softened. Add wine (or Pernod), fennel seeds, herbs, saffron and tomatoes. Simmer for a few minutes. Add stock, cover and cook on low heat (as you would cook a soup) for about 30 mins. Blend the soup – it should be quite thick. Reheat and bring to the boil. Add the orange peel and orange juice and zucchini and cook for a few minutes. Add the mussels, cover and cook until the mussels open. Place into soup bowls and serve with some crusty bread. Al cartoccio in Italian is the culinary term for cooked in a paper parcel or a paper bag and versions of this dish are cooked all over Italy. You may also have eaten pasta al catoccio and in fact, recently in a restaurant in Melbourne, I ate a version of pasta cooked in a bag and it was made with braised mushroom. 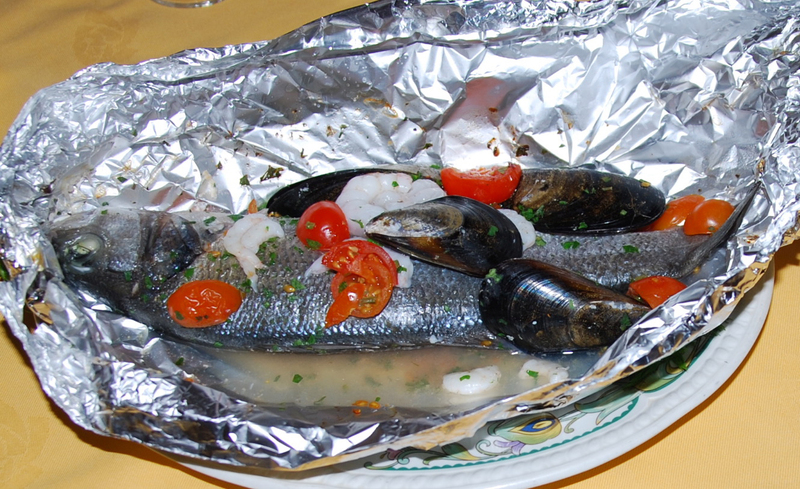 Last time I was in Sicily I ate Fish in a bag in a restaurant in Sciacca (south west coast). They had added a little seawater and a few prawns and mussels to their version (see photo below); I have used black olives instead. Traditionally the fish was wrapped in strong parchment-like paper, but metal foil has reached Italy and Sicily and has replaced the paper. I like to use foil, but I line the package with some baking paper – this prevents sticking and provides greater insulation. 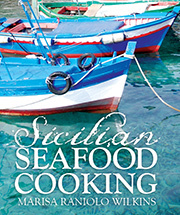 Adding seawater has been a common practice when cooking fish dishes and the restaurant called their version pesce in acqua di mare (fish cooked in seawater). If you live close to the sea, 1 tablespoon of seawater is sufficient. Every time I have eaten this dish in a restaurant in Italy, the parcel was presented at the table and pierced by the waiter; he then separated the fish into fillets and served it on my plate. 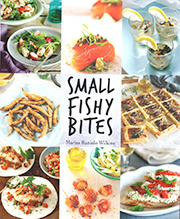 I have used a whole Yellowtail Kingfish for this recipe and it was sufficient for two people. Clean the fish: scale, gut and wipe dry. Use a sharp knife to make shallow cuts in the outside of a whole fish –slash the fish but leave whole. Fold the edges of the foil together tightly to make a neat package with an airtight seal. My fish weighed just below 1 kilo and I cooked it for 25 mins. The easiest way to see if it is cooked, is to check it after this time and cook it longer if necessary. Once you take it out of the oven, remember that the residual heat in the fish will cause it to keep on cooking, either keep it sealed if you wish it to go on cooking, or make a hole in the parcel to allow some of the heat and steam to escape. Serve the fish with the juices from the package. At the time of serving it, I added a drizzle of my best, extra virgin olive oil to make it more aromatic.